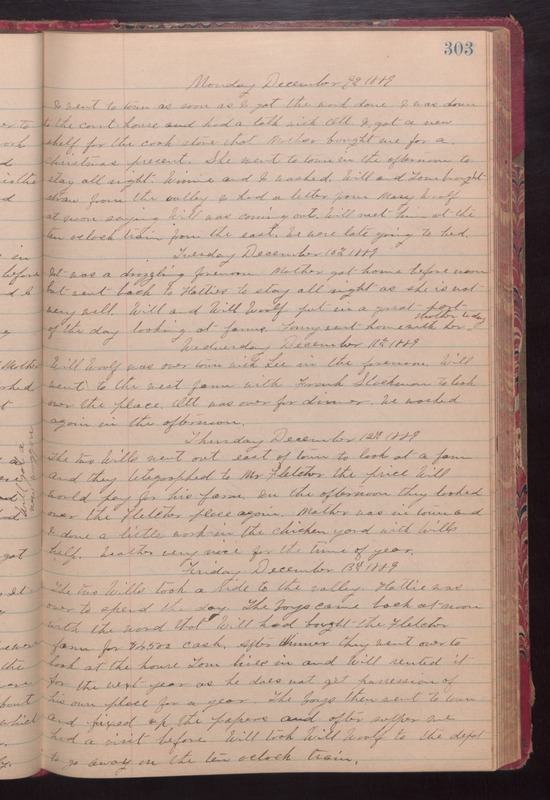 Monday December 9th 1889 I went to town as soon as I got the work done. I was down to the court-house and had a talk with Ott. I got a new shelf for the cook stove that Mother bought me for a Christmas present. She went to town in the afternoon to stay all night. Winnie and I washed. Will and Tom brought straw from the valley. I had a letter from Mary Woolf at noon saying Will was coming out. Will met him at the ten oclock train from the east. We were late going to bed. Tuesday December 12th 1889 It was a drizzling forenoon. Mother got home before noon but went back to Hatties to stay all night as she is not very well. Will and Will Woolf put in a great part of the day looking at farms. Fanny went home with her Mother today. Wednesday December 11th 1889 Will Woolf was over town with Lee in the forenoon. Will went to the west farm with Frank Stockton to look over the place. Ott was over for dinner. We washed again in the afternoon. Thursday December 12th 1889 The two Wills went our east of town to look at a farm and they telegraphes to Mrs Fletcher the price Will would pay for his farm. In the afternoon they looked over the Fletcher place again. Mother was in town and I done a little work in the chicken yard with Wills help. weather very nice for the time of year. Friday December 13th 1889 The two Wills took a ride to the valley. Hattie was over to spend the day. The boys came back at noon with the word that Will had bought the Fletcher farm for $4500 cash. After dinner they went over to look at the house Tom lives in and Will rented it for the next year as he does not get possession of his own place for a year. The boys then went to town and fixed up the papers and after supper we had a visit before Will took Will Woolf to the depot to go away on the ten oclock train.